This site is located off Cornishway, Woodhouse Park. A mixed development of 3 two bed houses and a pair of two bed bungalows, all for affordable rent. 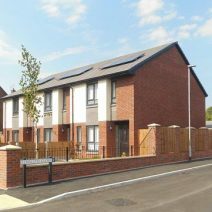 Part funded by the Government's Affordable Homes Programme, the development creates a quiet cul-de-sac, close to local shops, schools, the Lifestyle Centre and with superb transport links. All properties benefit from individual front and rear gardens with driveways, blending traditional construction with a contemporary design, meeting secure by design standards and incorporating modern energy efficient features including Photo Voltaic roof panels, high quality bathroom and kitchen fittings along with A-Rated condensing combi boilers to provide warm comfortable secure and efficient homes for our customers. This scheme was completed in March 2018.